Scroll down to see posting on ski conditions or to post a comment yourself. For photos from our recent Chili Sunday click here: Chili Sunday 2018. 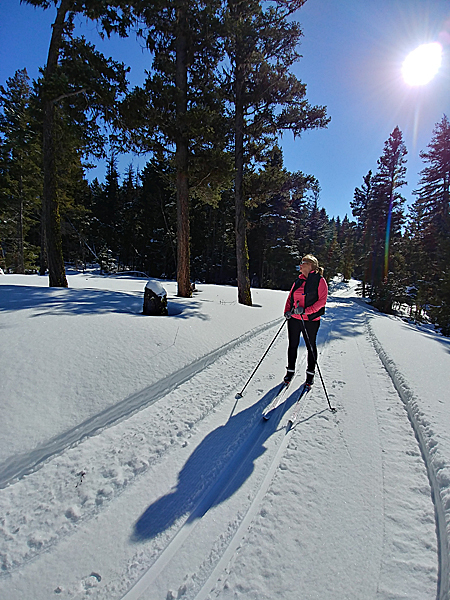 Well, I have been meaning to comment since we skied these trails (for our first time) on last Tuesday, March 13, under clear skies, with great track setting! Was our last area to visit on our way home. Snow was fabulous. We waited till it had warmed up, after noon. Headed up the Harmon trail then back from P5 on the Kane trail. Thank you! Menzies yesterday, it was a divine day of later morning skiing. Best to go early, once the sun is out it gets a bit sticky. Yesterday Hubby M., also groomed Harmon, Hill’s Homestead, Over Easy and Gulch. All trails groomed now for more March skiing. Thank-you Hubby M., for your grooming. Skied Matthew’s Loop for the first time March 10 and loved it. What a beautiful trail in the sunshine! Wow, skied Matthews loop today, best skiing I can remember in the past 30+ years. Grooming was fantastic. Thoroughly enjoyed our day. Thanks NNSC. Don’s grooming report from Friday. Minus 3 up to zero. Snowing all day, with one or two sunny breaks. We Groomed kane, aspen, porters, mathews chute, ravens,gulch vale, menzies, tillicum, neil’s, crossover, then lower vale. I measured a 100 cm snowpack at Lunchbox landing. Awsome! Just a note with expected sunny skies for the next several days…I believe the snow will be nice and firm in the mornings and then sticky to mush in the afternoons, so beware. What a great snow pack this year, it should be around for a while yet, happy skiing everyone. Don and Hubby M., are out grooming the trails today. There was 2 inches of fresh snow early morning and temp is apprx. -4. Don will post his grooming report when done. Thank-you Don and Hubby. I skied Matthews Loop with the dog and then Raven’s Ridge-Tillikum-Neil’s Valley-Vale-Menzies loop. All good skiing – Raven’s Ridge is smooth and velvety – just great. Matthews is getting a bit chopped up and Neil’s Valley is a bit soft underfoot. It was -6C at 10 AM and -1C at 12:30 so I would recommend going early in the day, especially since the forecast is for warmer weather in the week ahead. It was good to see several carloads of people out on the trails – even on a weekday morning. The snow is deep and will last a long time still. It is well worth getting out there. Hey everyone skiing in the Kane is on, lots of new snow and lots of grooming today.